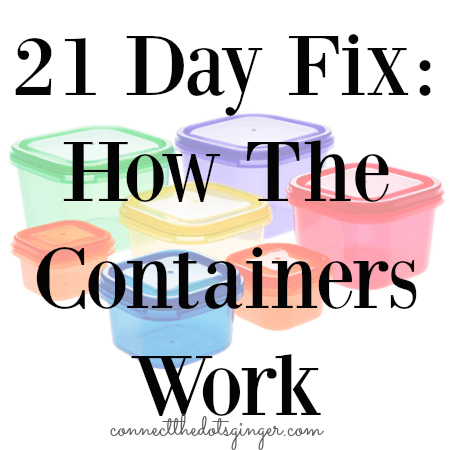 If you are new to the 21 Day Fix program, be sure to check out my Tips To Getting Started Post as well! The hardest thing about losing weight is the FOOD PART OF IT! Nutrition. Healthy Eating. Clean Eating. Whatever you want to call it, that is the part that most people struggle with. Why??? Food is good. Food is AMAZING and it is yummy and IT IS HARD TO CHANGE HOW YOU EAT! Plus, restaurants are serving up huge portion sizes that are enough for 2-3 people most times and sometimes the portion sizes we eat at home are too big. And for me, I grew up in a household where you had to eat all your food. So combine HUGE PORTIONS with the thought of having to clean your plate, leads to over eating. 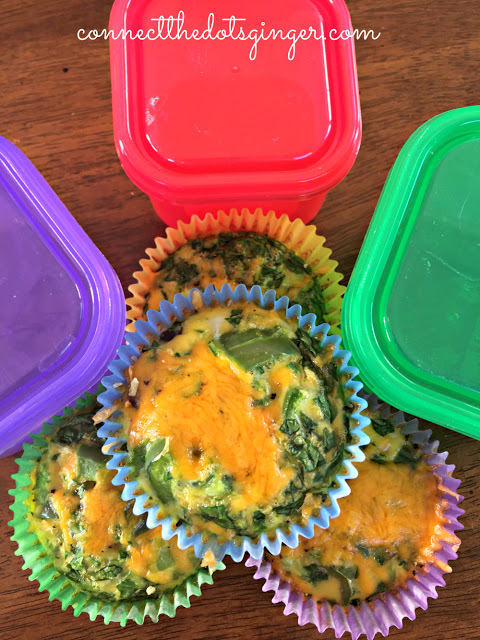 The Color Coded Containers were created to solve the problem of over eating and make learning portion control easy and fun without having to count calories. 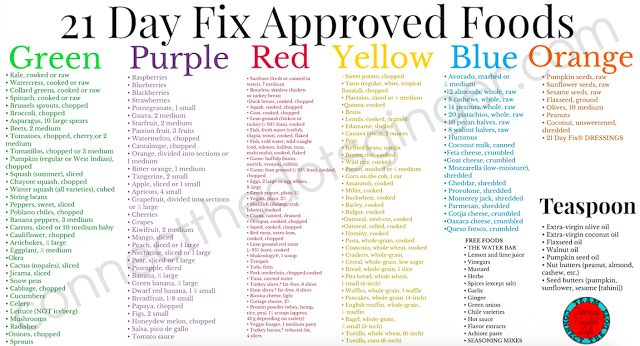 If the food fits in the container and it's on the approved food list, you can eat it! The green container is for vegetables. These can be cooked or raw, sliced or chopped. Some examples include lettuces, kale, squash, peppers, mushrooms, and onions. Go ahead and really squish the lettuce into there to create a nice big salad! This is the only container that I personally suggest that you can a) squish full of and b) eat more of during a day. We all could use more veggies! The yellow container: carbs & starches. This is where you’ll fit in foods like rice, beans, sweet potatoes, and whole-grain pasta into your diet. No squishing of foods here, please! For foods that don’t easily fit into your container such as waffles and tortillas, the portion amounts are in your 21 Day Fix guide. There is also a teaspoon measurement included in the 21 Day Fix program, and this is for oils and butters, such as olive oil and peanut butter. 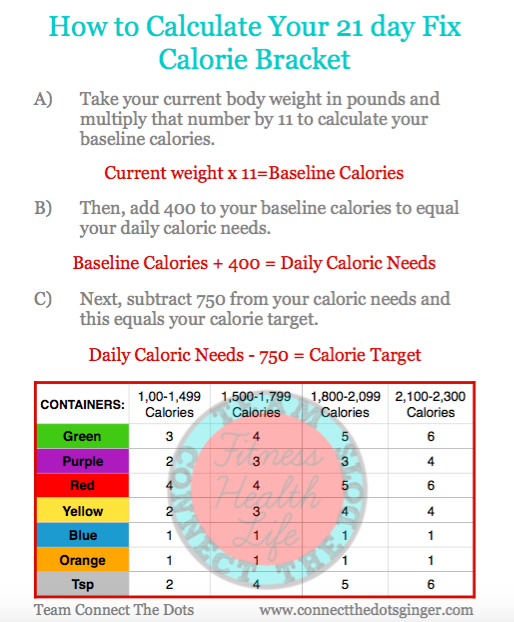 First, take a look at the calorie bracket chart to figure out how many containers of each color you should eat each day for your calorie range. Once you know that then and you know what goes in the containers, it’s time to use them. Use the first 2 weeks to use the containers every single day so you can truly see how much you are supposed to eat and help you learn portion control! If you’re paying attention to macronutrient percentages, you’ll notice that the plan is roughly 40% carbohydrates, 30%protein, and 30% fat. Feel free to mix and match foods in each container too. Have some 1/2 yellow of rice and 1/2 a yellow of quinoa at lunch to give you 1 full yellow container. I personally measure out the portion in the containers and then empty the container out onto a plate or into a bowl then rinse them out so they are ready to go next time I need them. No counting calories. Just count and follow how many containers you use a day. And it’s a lot easier to keep track of three green containers than x number of calories. It is plenty of food. Often when people begin this program, they find that they’re full even before they’ve finished all their container portions for the day. That’s because healthy food has more volume than junk food. If you find you find this is the case for you, only eat what you can, but make sure to eat a little from all the containers instead of just filling up on your favorite kind and avoiding what you like the least. Start with your red and green containers on your plate, leaving your yellows for last if you find you are getting too full. It can take a week or two for your body to get used to the volume of food you will be eating, which is the correct amount of healthy food that you want to fill your body with! It teaches you how much you really need! Portion control is about moderation and being aware of what you’re eating. The containers help you do this. After you’ve completed your first 21 days, you’ll have a good idea of how many fruits, vegetables, lean proteins, and healthy fats you should be eating every day. Need some ideas on what to eat? Check out the perfect companion for your containers to get amazing meals, the FIXATE cookbook. Has options for Gluten Free, Vegan, Vegetarian, and it isn't just for the containers. It does have the nutritional info for each meal in it including macronutrients counts. Good, healthy eating is what this book is all about and I use it ALL THE TIME!